Hope you have already subscribed to my 5-day free option course. If not please do so. You will see a form on top of this page. Please fill it correctly and hit Submit. Make sure you get a confirmation email from me (Dilip Shaw). Please check all folders in your inbox. If you got a confirmation email, your course will begin next day and will go to your email for next five days. Its jam packed with a lot of knowledge about option trading. Next you can read these free strategies written by me to help you become a good trader. Of course its not possible to give support on these strategies as they are free to all. I offer two paid courses. Support is there for one year in the paid courses. Basically you will learn how to hedge options & futures and trade peacefully. If there is peace of mind I am sure you will agree that the results will be far better than when you trade in stress. Hedging ensures that your loss is limited so that you can wait for profits. You can see many testimonials here and here of my courses. To know more you can whatsapp me on 9051143004 – click to whatsapp or send me an email. 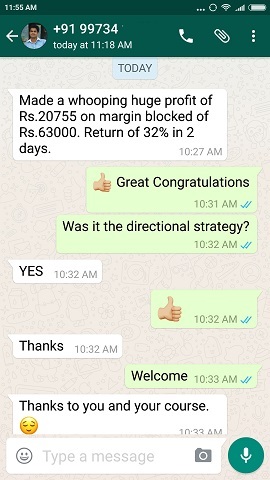 Please note that using these strategies you will be able to make 3-5% return a month without stress and without looking at your trades 24*7. Using the same logic you can trade commodities as well. 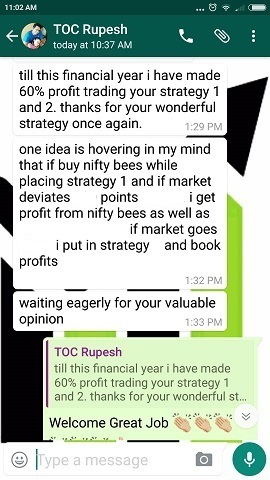 Please note that it took me a long time to write these strategies – so there can be difference in lot size of Nifty and price of Nifty. I have written them with the prices and lot size during the time of writing. 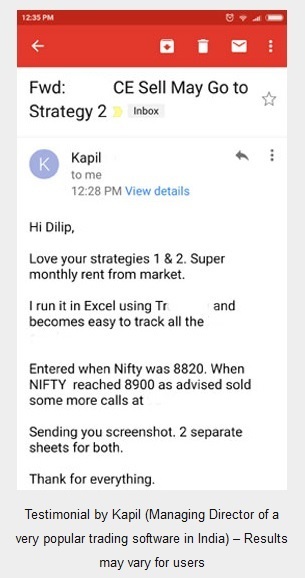 Disclaimer: All the free advise and/or the strategies written here and in my site have come out of my education and experience in trading Nifty or Indian stocks – or from reading books and/or research. These are not investment advice its for educational purpose only. Please invest after through research as stock market investments are subject to market risk. However I have reserved some very good and consistently profit making Options and Futures strategies which are available as a Course only to my paid members. 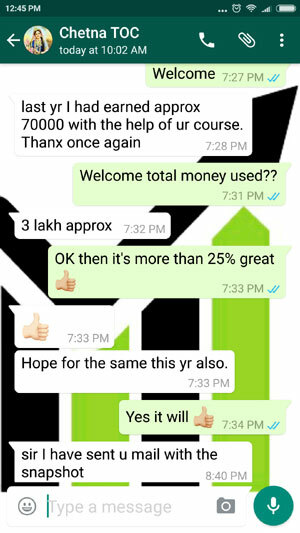 Click here to know more about my conservative option trading strategies course. Please do your own judgment and research before attempting these trades. I am a conservative trader and make sure I hedge my position always even if the strategy involves going naked options trading. I am a firm believer of managing risk even before placing my trades and henceforth recommend playing small lot size if you want to trade the following strategies. You are responsible for profits or losses generated from these trades. If you have little or no experience in any new option strategy, I highly recommend paper trading for at least one month before attempting them. Before going through these strategies please read Option Greeks to know how options are priced and behave. 1. How To Avoid Losses Selling Naked Options – A lot of traders sell naked options. It is very risky though. Read to know how to avoid huge losses. 2. Going Long Buying Options – Learn the best ways to buy options. 3. Credit Spreads – A very popular strategy in the world, unfortunately traders have no idea what to do if it goes wrong. Get tips to play it the right way. 4. OTM Option Buying – Some traders looking for a jackpot buy deep out of the money options. Learn ways to trade them in the best possible ways. 5. How to Take Benefit of Trending Stock – Most traders do not take advantage of a trend. Read to know how to make the most. 6. Married Put – Amazing strategy to block the profits. 7. Short Put – Works great if the stock is going up. 8. Covered Calls – Works best with stocks in a range-bound trend. You will still make great money. 9. How to Reduce the Cost of Buying Options – There are ways to reduce the cost of buying options. Read to know how. 10. Long Combo – In a long combo both calls and puts make money. However it is a very risky strategy. You sell one option to get money to buy another. 11. The Collar Strategy – Involves a future buy, and option sold and an option buy. Loss is limited. Profit is also limited. 12. Bull Call Debit Spread – A simple strategy when your view is bullish. 13. Bull Put Credit Spread – Rewards the same as Bull Call Debit Spread in the same strike price. The only difference is that this is done on the put side when the view is bullish. 14. Bull Calendar Spread – By selling one current month call and buying another next month call. 15. Covered Combination – Slightly risky strategy if you own a stock. 16. Call Backspread Reverse Call Ratio Spread – Buy one ITM call and sell two OTM calls. 17. Diagonal Call Spread – Sell current month call and buy next month call. 18. Stock Loss Repair Strategy – Helps you repair a stock that has lost value. 19. Stock Decline Protective Put – Buy a put to protect profits. 20. Long Straddle – This trade is done when a big move is expected in a stock. This could be because of a news or an event happening. If a big move does occur in any direction, the trader makes money. 21. Short Straddle – Exactly opposite of long straddle. When the stock stays in a narrow range, the trader makes a profit. 22. Long Strangle – Buying OTM calls and puts or buying calls and puts of different strikes. 23. Short Strangle – Selling OTM call options and put options or any call and put options but of different strikes. Also know Short Strangle adjustment strategies. 24. Long Call Butterfly – Sell 2 ATM, Buy 1 ITM and Buy 1 OTM Call options. 25. Short Call Butterfly – Buy 2 lots ATM, Sell 1 ITM, Sell 1 OTM Call options. 26. Long Put Butterfly – Sell 2 ATM, Buy 1 ITM, Buy 1 OTM Put options. 27. Short Put Butterfly – Buy 2 Lots ATM Put Options, Sell 1 Lot ITM Put Option, Sell 1 OTM Put Option. 28. Strap Option Strategy – Buy 2 ATM Call Options, Buy 1 ATM Put Option. 29. Strip Option Trading – Buy 1 Call, Buy 2 Puts. 30. Long Call Ladder Strategy – If you sell naked call options for eating premium this is a must read. Involves buying 1 call option and selling 2. 31. Long Put Ladder Strategy – The Long Put Ladder Strategy is a trade where you have a mildly bearish view on a stock. 32. Short Call Ladder – If you are bullish on both the stock and volatility then short call ladder can be traded. 33. Short Put Ladder – In Short Put Ladder the trader is bearish. Traderâ€™s view on volatility should be bullish. 34. Call Backspread Trade – When a trader wants to buy call options, but sells a few to recover some cost of buying. 35. Neutral Calendar Spreads – If the view is neutral, but Volatility going to increase. 36. Long Guts – If the view is very bullish or bearish and Volatility increasing you can buy both ITM calls and puts. 37. Short Guts – If the view is range-bound and Volatility decreasing you can sell both ITM calls and puts. 38. Short Ratio Call Spread – For range-bound market. Buy 1 In The Money (ITM) Call Option and Sell 2 (or double the number of) Out Of The Money (OTM) Call Options. 39. Ratio Call Write – For range bound markets. Buy X Lots in Nifty Futures OR Stock Futures or Stock in Cash and sell 2*X Lots ATM (At The Money) Call Options current month. Works best if you buy the stock in cash. 40. Ratio Put Spread – Is a neutral strategy. Buy 1 ATM Put, and sell 2 OTM Puts. If the stock stays in range, the trader profits. Profits are limited but loss unlimited. 41. Ratio Put Selling – It is taking a Future trade and hedging it by selling two at the money options. 42. Iron Butterfly – Selling ATM options and buying OTM options. Good for range bound market. Please keep coming back to look for new free option strategies. I will update this page as soon as I post a new strategy in this website.